Vous pouvez également utiliser 21200 Kobo Super Points pour l'obtenir ! 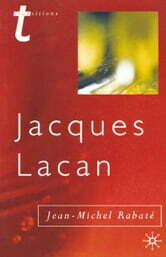 The French theorist Lacan has always been called a 'literary' theoretician. Here is, for the first time, a complete study of his literary analyses and examples, with an account of the importance of literature in the building of his highly original system of thought. Rabate offers a systematic genealogy of Lacan's theory of literature, reconstructing a doctrine based upon Freudian insights, and revitalised through close readings of authors as diverse as Poe, Gide, Shakespeare, Plato, Claudel, Genet, Duras and Joyce. Not simply an essay about Lacan's influences or style, this book shows how the emergence of key terms like the 'letter' and the 'symptom' would not have been possible without innovative readings of literary texts. Ernest Fenollosa Ars poetica or The Roots of Poetic Creation?